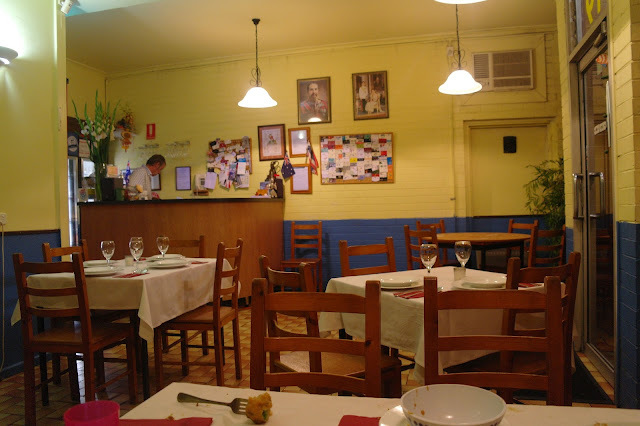 I received a lovely surprise the other day in the form of an email from Lauren from the wonderful Footscray Food Blog inviting Tina and I to check out Thai Thoranee in Newport. Of course I immediately agreed and we arranged to meet there that Saturday night. It goes without saying that I was excited about trying a new Thai restaurant and a quick look at their menu on Urbanspoon had me salivating. I was also looking forward to meeting Lauren in person as Footscray Food Blog is definitely one of my favourite food blogs and thanks to Lauren I have enjoyed many, many excellent meals in restaurants that I would never have found without her help. I was also really looking forward to meeting my first fellow food blogger, Lauren and I had traded a few emails but there is no substitute for a good old face to face chat, and no better place to place for a couple of food bloggers to have a catch-up than over dinner at a local restaurant. Thai Thoranee is quite a small establishment but very cosy and perhaps a bit homely. 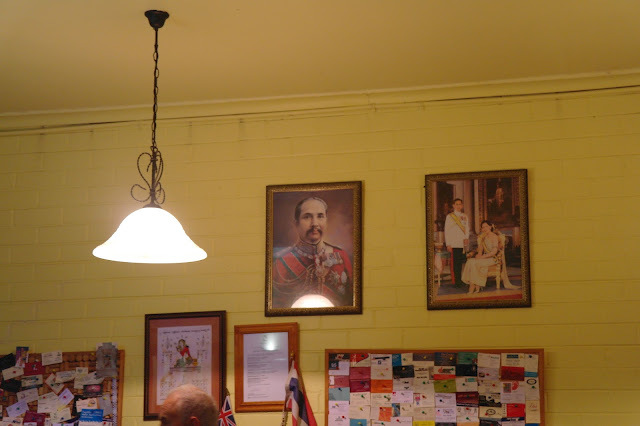 Aside from the great food, my favourite thing about Thai Thoranee is the portraits of Thai royalty. No true Thai business is complete with out portraits of Thai royalty. I'm pretty sure on the left is King Chulalongkorn (Rama V) and his impressive moustache and the on right is the current King Bhumibol Rama (IX) and his wife Queen Sirikit. The Thai are very respectful toward their royalty and the display of royal portraits is considered to provide good fortune as well as being a show of national pride. The first meal to arrive was the Yam Pla Goong. 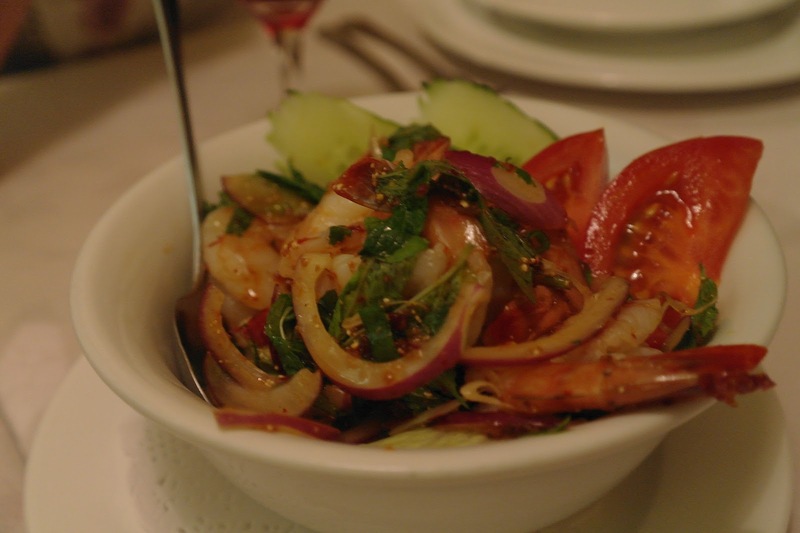 Yam is Thai for salad and I think Pla Goong is prawns as this dish contained some deliciously seasoned juicy prawns. They were complimented by the usual sliced shallots, tomatoes, cucumber, iceberg lettuce and asian herbs, all of which added a lovely crispy freshness. I love this style of meal, so light and fresh and my love of the Thai lime, chilli, fish sauce and sugar dressings shows no signs of diminishing. I couldn't help but scoop the remaining spoonfuls of dressing like it was soup. If you look closely you can also just make out a few of the specs of what I believe is ground toasted glutinous rice (Khao Khua) that is quite commonly used in Thai salads to add a special toothsomeness that is unique to Southeast Asia. No Thai meal is complete without rice but instead of ordering our usual steamed or sticky rice we decided on the Khao Kati which was described as coconut rice mixed with Thai herbs. As the meal contained pieces of chicken I'm not 100% certain we actually received the Khao Kati, I suspect that we may have been given the Khao Pad Prig which is fried rice with chicken, vegetables and red chilli paste. The rice was delicious and to be honest we were so busy chatting and enjoying watching the girls get along so well we really didn't notice. 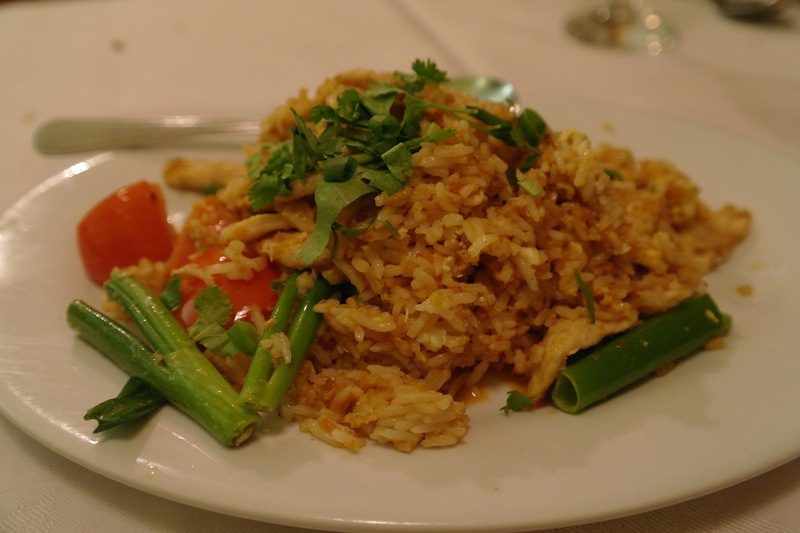 I've never had either Khao Kati or Khao Pad Prig previously so I can't be sure but I am sure that whichever it was, it was superb and an excellent compliment to our other dishes. 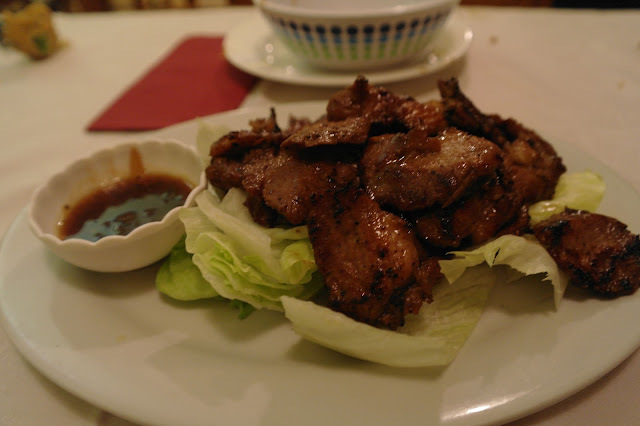 Next up was the Moo Yang (grilled pork), this was a tough decision as Thai Thoranee also serve Gai Yang (grilled chicken) but it definitely turned out to be a good one. This was probably my favourite meal of the evening in which all the meals were superb. The pork was lovely and tender and had a grilled smokiness that I decided must have been imbued by cooking over charcoal although I do admit that I may have been letting my imagination get the better of me. I don't know how many Thai restaurant kitchens have charcoal grills but based on the glorious smokiness of this Moo Yang, they should be made compulsory. Once again the iceberg lettuce provided a wonderful fresh crispiness. You have to eat the lettuce with the grilled meat, it isn't just a garnish! Oh yes, the sauce was also amazing. I got so carried away with the pork that I didn't even try the sauce until the very end, bit of a mistake there. Oh well, next time. If rice is mandatory for all Thai meals then noodles are a close second. On this occasion we decided to go with the Pad See Ewe. 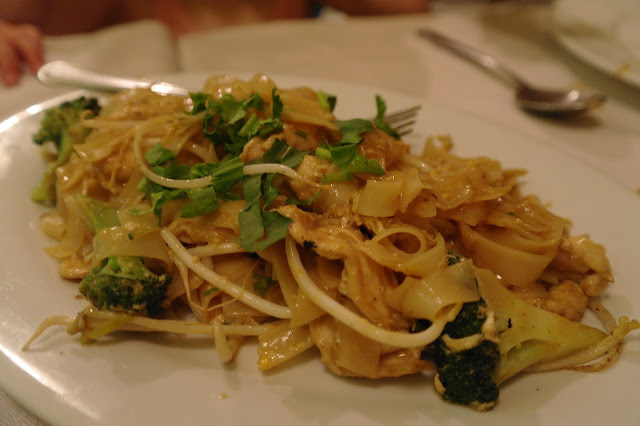 Everyone loves Pad Thai and I am no exception but I recently saw a post on She Simmers (my favorite Thai cooking blog) and it got me thinking that while I knew what Pad See Ewe was, I really had no memory of actually eating it. I had an old hangup that I didn't like wide rice noodles which is why I never ordered it but then when I was thinking about it I realised that this hangup was based on experiences that were so long ago I couldn't even remember why I felt that way, yep pretty strange! Once I realised my foolishness I knew I was going to get back on the horse the first chance I got and fortunately Thai Thoranee turned about to be an absolute thoroughbred! The Pad See Ewe looked quite simple and aside from the wide rice noodles contained chicken, broccoli and bean sprouts. In contrast to its simple appearance the flavour was anything but simple. I tasted a tangy sourness that I thought may have been tamarind although I wasn't really sure. Identifying individual ingredients from taste is definitely not one of my strongest skills but I have a go anyway. I'm sure that another contributor to the special flavour of this dish was what the Cantonese refer to as 'wok hei'. In the post from my link above, She Simmers calls this the 'secret wok smell'. Unfortunately for those despairing home cooks 'wok hei' cannot be obtained from the standard oven gas burner, you need something much more powerful than that and I am guessing an equally powerful extraction fan would also be required. And yes, I'm now a born again Pad See Ewe convert! In summary, Thai Thoranee rated very highly in my opinion. It was relatively inexpensive with most meals around the $10-$15 mark and $20 for the seafood options. They were also very tolerant of loud children which earns them the 'family friendly' tag. Good Thai restaurants are far and few between in the western suburbs (although this seems to be improving) and Thai Thoranee was up there with the best of the west. We will certainly be returning soon, Next on our hit list is the Gai Yang (grilled chicken), Gang Pedt Yarng (BBQ Roast Duck Curry with Lychees) and any (or all) of their stir fries (extra 'wok hei' for me please). A big thankyou to Lauren for once again steering us to another hidden gem, you truly are the good queen of the west! We really enjoyed ourselves Lauren, I'm keeping my eye out for another interesting looking Thai restaurant so we can do it again. we've been eating there for over a decade - since our kids were young anyway, and are going there tonight to celebrate our youngest son's 18th! I'm glad to read your very positive review ( and to hear that Lauren is also a fan) - I think they are up with the best thai restaurants in melbourne, but they don't seem to rate on many other people's lists. ( I'm not expecting it to be quite as good as the superb food I had at chon siam in sydney a fortnight ago - which I tracked down on your recommendation). Thankyou, yes I do remember my meal at Thai Thoranee quite fondly. The food is a great blend of authentic Thai with a bit of a tweak to make it a bit less spicy for the Australian tastes. Also great out that way is Sweet Rice if you're looking to try somewhere new. I'm pleased you enjoyed Chon Siam, Sydney definitely has some great Thai food. I just ove love love Thainatown! First started eating there when it opened because we were a big fan of Katy's when she managed a Thai restaurant in Williamstown that will remain nameless (silly them for letting her go. 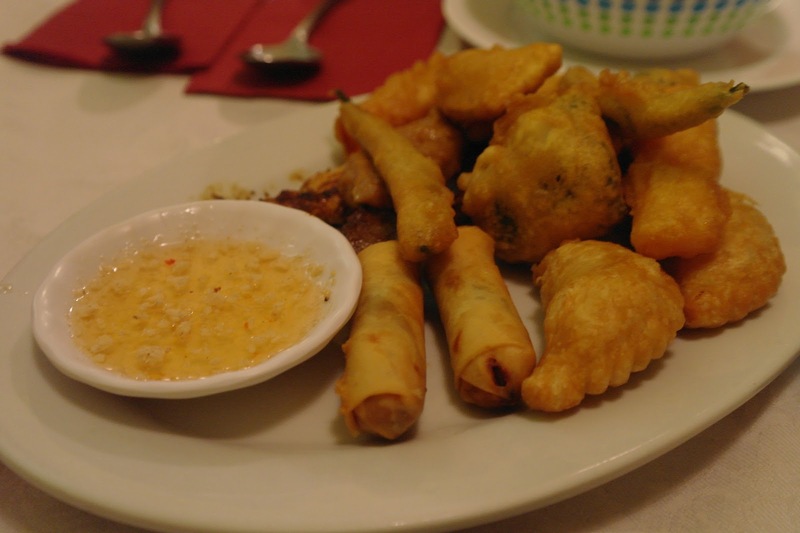 We love the food and have never had a bad experience - takeaway or dine is always a great delight. The dine in experience is a lovely homely treat, as the Maitre D tries so hard but obviously has no idea- his heart is in the right place tho and I suspect he is closely related to Katy. Well done to this lovely family for taking a chance and continuing to provide good clean cheap Thai food to Newport and surrounds. Thanks for the comment, It's been a while since I ate at Thoranee but I'm glad to see they are maintaining the high standards we enjoyed on our last visit.